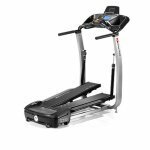 The Bowflex TreadClimber TC5300 – 3 Machines in One! While you are probably familiar with the name, the Bowflex TreadClimber TC5300 might not be on your radar screen yet. However, with its hybrid style and multi-use functions, it’s certainly getting the attention it deserves. Instead of being ‘just’ a treadmill, the TreadClimber TC5300 provides the climbing action that can really take your workout to the next level – literally. The price tag for the Bowflex TreadClimber TC5300 is hefty, about $3000 depending on where you buy it from. But, you’re getting a lot in the package that might make up for the higher investment. Bowflex’s addition of climbing action is a new innovation in the treadmill market that’s really the highlight of this machine. The Bowflex TreadClimber features plenty of electronics that you can use to monitor your progress – a wireless heart rate monitor, climbing indicator, and multiple displays for calories, time, and more. 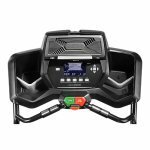 UPDATE: The TC5300 is no longer being sold and has been replaced with all new TreadClimbers, including the TC100 and TC200. If you're looking for something comparable to the TC5300 it would probably be the up-level TC200, as it has same speed up to 4.5 mph and a stronger warranty. It adds some new features such as a media shelf and workout tracking capability via Bluetooth, yet the price tag is still the same at around $1,999. So look at the new TC200 if you're in the market for a TreadClimber. 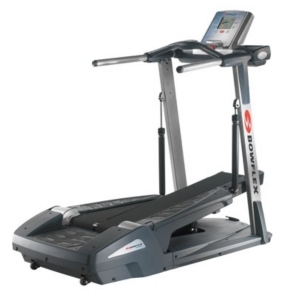 Experts like the smooth, fluid motion of the Bowflex TreadClimber TC5300 which provides a workout with little or no impact to ankles and knees. Independent studies found the results of exercising on this treadmill dramatic: twice the calories were burned during a 30-minute workout when compared to running on a treadmill at the same speed! Users of the TreadClimber TC5300 agree that they get more exercise done in less time than on a traditional treadmill. 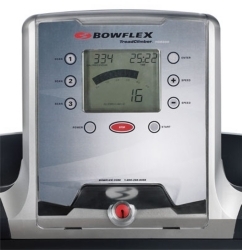 The fun part most users raved about is Bowflex’s innovative feature that shows you how many floors you’ve climbed. With its hefty price tag, the TreadClimber TC5300 is going to be a hard sell to the beginner to exercising, but the workout is superior to the traditional treadmill. This machine is like having a treadmill, elliptical trainer and stair stepper all rolled into one unit. The only concerns we have are the plastic parts found in Bowflex treadmills. Fortunately, the warranty on the Bowflex TreadClimber TC5300 will have you covered if and when anything breaks down. Editor's Note: As it is no longer around, look at the new TC100 and TC200, two upgraded machines with additional features not present on the TC5300 TreadClimber.